What is radiant heating and cooling? Radiant heating was first documented by the Romans, who built small fires under their flooring to warm their homes from the ground up. Since then, there have been other forms of radiant heating, but mass culture has made forced-air heating and cooling systems the norm. However, radiant heating and cooling has all but disappeared. Talbott prides itself in designing and installing these modules in a home or business' floor or ceiling so that its inhabitants can experience the utmost comfort. Radiant heating and cooling modules transfer radiant energy created by running recirculated water through tubing to objects within the space. In other words, radiant modules heat and cool its immediate surface (like the ceiling or floor) which then radiates out the specific temperature to objects such as walls, floors, and furniture. This creates a consistant temperature throughout the entire building without having the discomfort of feeling or hearing the forced air. Since this system uses up to 40% less energy than a typical forced air system, it is better for the environment as well as your check book. Additional savings come from the design of the system. Radiant is installed directly into the floor or ceiling, only leaving enough space for the actual system. Therefore, you can kiss goodbye the days of changing out air filters and hiring someone to clean out your air ducts and vents. Those who suffer from allergies or asthma will live in a healthier building, as dust particles and allergens do not have air ducts and vents to accumulate in, and are not aggravatingly blown around the building. Why not opt to live or work in a healthier, greener and cost-effective home/business? Talbott installs xLath™ tubing in the ceiling behind the drywall to provide a lowmass fast reacting heating and cooling panel. Maintenance is less invasive than in a floor system, and can achieve heating as well as cooling. Radiant heating from ceilings is a less common practice and usually uses electric cables. Traditional radiant heating practice is to install hot water tubing systems in the floor. This is suitable for buildings in heating only climate zones. Maintenance may be invasive. 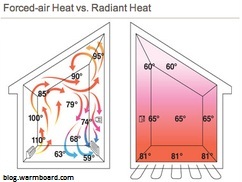 Radiant cooling is a method used in high-rise buildings. However, it is rarely possible to meet cooling loads with radiant chilled floors, therefore chilled water tubing in ceiling panels are used. Less well known are roof pond passive solar heating / cooling systems developed/invented by Harold Hay. These heating / cooling systems provide good comfort and economy, but make the top of the building very top heavy.